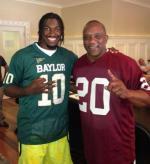 Direct Sportslink has secured numerous sports celebrity talent, including Billy Sims, for the popular Nissan Heisman House commercials. The Nissan Heisman House commercials feature former Heisman Trophy greats getting together in funny televison commercials to support Nissan's sponsorship of the Heisman Trophy and Heisman Trust. To secure Billy Sims for any personal appearance, speaking engagement, or endorsement please contact a Direct Sportslink talent booking agent. We work directly with Billy Sims and will provide you Billy Sims appearance fee and availability to secure him for your next event. A Billy Sims personal appearance, Billy Sims speaking engagement, or Billy Sims endorsement will reflect well on your company. To hire Billy Sims now for any corporate appearance, fundraiser, motivational speaker event, personal appearance, autograph signing, or website endorsement please contact our celebrity agents at 1-877-6-SPORTS. We will contact Billy Sims or contact Billy Sims' agent and provide you with the booking fees and availability immediately upon your request. Direct Sportslink is the only sports speakers bureau and talent booking agency based in the United States securing only sports talent for corporations, associations, and organizations for motivational speaking engagements, personal appearances, and endorsements. We are the premier sports celebrity booking agency and a sports celebrity procurement expert. Accordingly, we will provide you with any relevant Billy Sims website information and booking agent details so that you can hire Billy Sims for your next event. When the name Billy Sims is mentioned, one description always springs to mind - football legend. In short, Sims was one of those rare, highly gifted individuals who arrives on the college football scene and through his sheer greatness makes an impression that lasts for decades. Recruited to Oklahoma in 1975 under renowned coach Barry Switzer, Sims suffered injuries early and missed his entire freshman year and most of his sophomore season. Making up for lost time, Sims, sporting his now famous number 20 jersey, exploded onto the scene during his junior year (1978), tearing up one defense after another with his graceful yet deceptive style. In the process he racked up a record 1,762 yards on 231 carries for an average of 7.6 yards per carry or 160 yards per game. He also became the only back in Big 8 history to rush for more than 300 yards in three consecutive games. That amazing year, Sims was the nation's leading rusher and scorer. It was no wonder that he became only the sixth junior in history to win the Heisman Memorial Trophy. 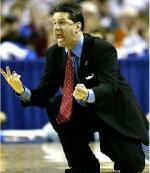 He also was named consensus All American, and AP and UPI College Player of the Year. 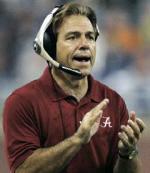 He followed his junior year with a stellar senior season and was runner up for yet another Heisman Trophy. 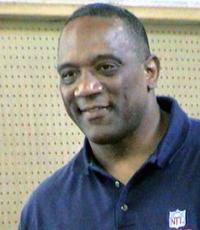 In 1980, to no one's surprise, Sims was the number 1 pick in the NFL draft and went on to a successful, though brief 4 ½ year career with the Detroit Lions. He was named NFL Rookie of the Year and helped turn the Lions from a losing team (2-14) into a winner (9-7 after Sims arrived). In his brief pro stint, Sims gained 5,106 yards, scored 42 touchdowns and was named to the Pro Bowl three times. In 1984, a knee injury ended Sims' football career. Sims retired to a ranch in Hooks with his family and became involved in numerous business ventures. In 1995, Sims was inducted into the College Football Hall of Fame. Sims has served as a Vice President with AmericaCan, a nonprofit organization based in Dallas that helps troubled youths through charter school education. With Billy Sims BBQ, Sims opened another chapter and a new opportunity, sharing with his customers two things he has been passionate about all his life: good football and good barbecue. In 2007, a bronze statue of Sims was dedicated at the University of Oklahoma at Heisman Park. Based on your interest in Billy Sims as a speaker or for a personal appearance, Direct Sportslink has provided you additional links below for other sports talent with similar appearance fees, speaker topics, and categories that match Billy Sims.